IRAN: FROM THE PAST TO THE PRESENT - A Journey through History, Art and Architecture. This tour will provide insight into the rich, cultural heritage of the ancient Persian Empire dating back more than 2000 years. We will learn how in the first millennium BC, the Achaemenid rulers established their power until the conquest by Alexander the Great, and later when Iran became an Islamic country in the 7th century. Several UNESCO sites, renowned worldwide for their outstanding features, reveal significant historical developments in these great civilizations. We will focus on the diversity of artistic expression in arts and architecture through visits to wonderful museums to admire their treasures on display and exploring ancient glorious sites with their historical context. We will also understand how Iran, bordered by ten countries, located between Mediterranean, North African, Middle-East and Asian countries, has played and still playing a strategic role in the world History. During our tour we will be introduced to Islamic religions, such as Shi’ites and Suni’ites, and we will see how nowadays people are living. A memorable time will be spent in the cultivated city of Shiraz which has been synonymous with learning, nightingales, poetry, roses and, at one time, wine. 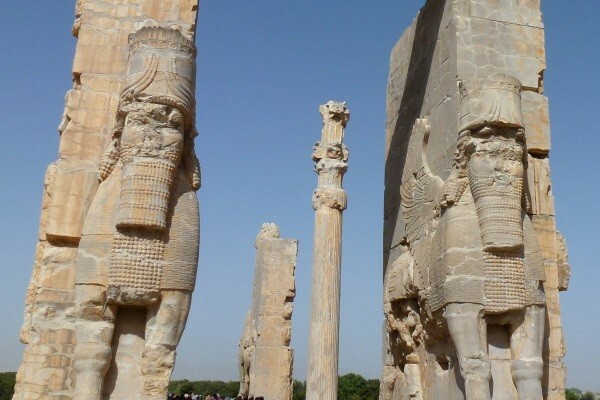 One of the highlight of our trip will be the fascinating ruins of Persepolis, the ancient Persian capital and Naqsh-e Rostam, a necropolis dating from 1000 BC. We will enjoy strolling in beautiful gardens dotted with pavillons and royal buildings – Eram Garden, the gardens with tombs of the two renowned Persians poets, Hafez and Saadi, and Nazar Garden with the Pars Museum, a delicate octagonal pavillon built during the Zand dynasty (18th century). A walking tour in the city will take us to Vakil Mosque, Nasir-ol-Mosque, and Ali ibn Hamza Shrine to admire its marvelous reflecting mirror works. Yazd, in the desert, is one of the world’s oldest towns and was an important Zoroastrian centre. It was an ancient caravan city whose prosperity was established by the Silk Trade until the 17th century. It will be fascinating to wander around the Old City and visit the famous Jameh Mosque, Zoroastrian Towers of Silence, Ateshkade (Fire Temple), the Amir Chakhmaq Complex and Dolat Abad Garden, another Unesco site. Tehran, Capital of Iran established by Agha Mohammed Khan, Qajar King, since 1776, is considered to be the heart beat of the country. We will visit the Golestan Palace (Palace of Flowers) which was the official residence of the royal family until 1979 (Iran revolution). To conclude our tour we will visit the National Archaeological Museum, the Carpet Museum, the Glass and Ceramics Museum, Reza and Abbasi Museum, to see the great past of Persia and the rich art of Islam. At last, a glimpse at the Tehran Museum of Contemporary Arts will open perspectives on modern artist works. This trip is specially designed to explore the main fascinating sites of Central Iran and, flying from Esfahan to Tehran we avoid long and tiring hours in a coach. More details can be given to answer your questions about dress code, safety measures, etc.